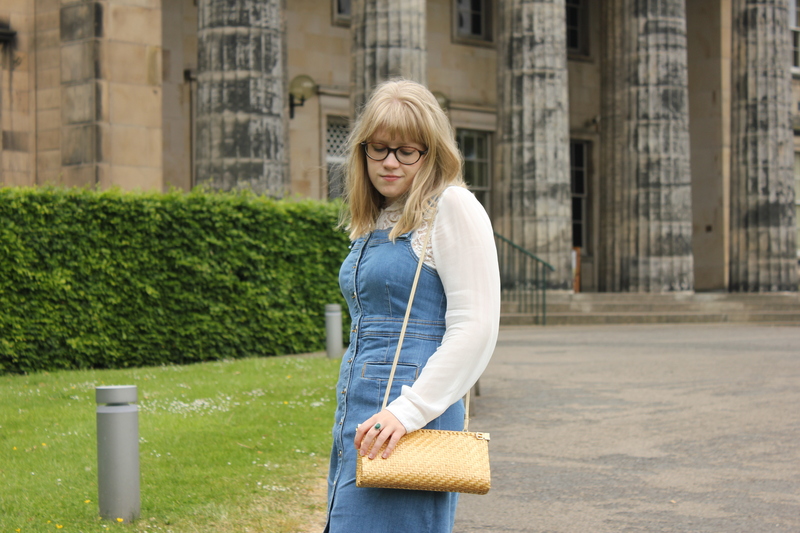 In a bit of a contrast with my recent, sunnier posts, I look out of the window and it’s so grey and miserable that you’d think it was Autumn already here in Edinburgh – never mind nearly Midsummer! 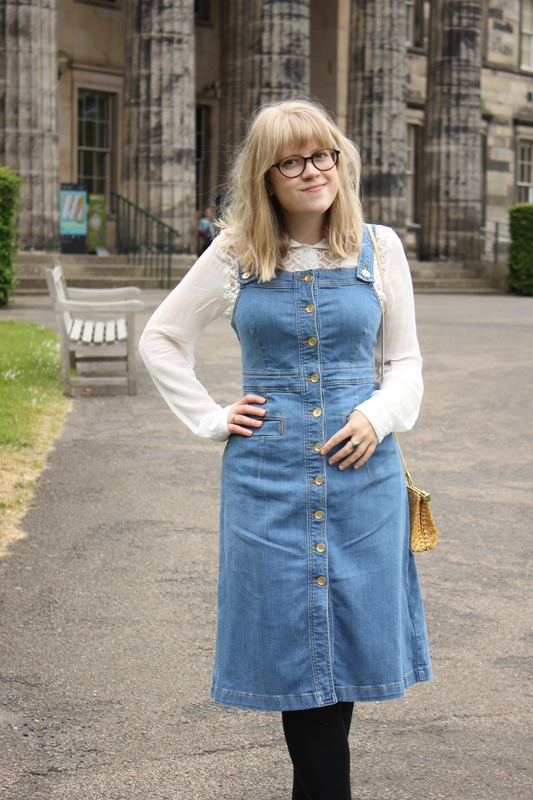 I am an autumn/winter lover at heart, but I’m still itching to wear the vintage floral sundresses I’ve been hoarding, and shockingly my sandals have yet to get an airing this year. 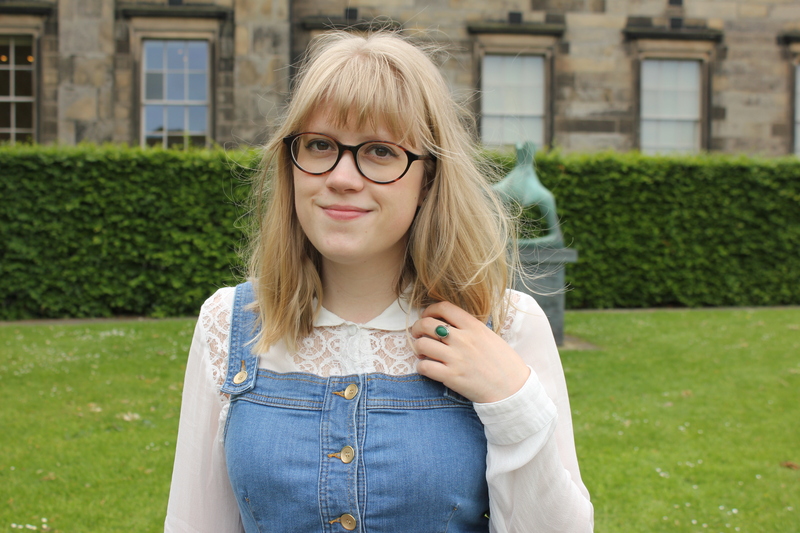 It’s probably never safe to pack away your knitwear, wellies or even coat here in Scotland, but that doesn’t mean I’m bundled up in my woollens (at least not every day). 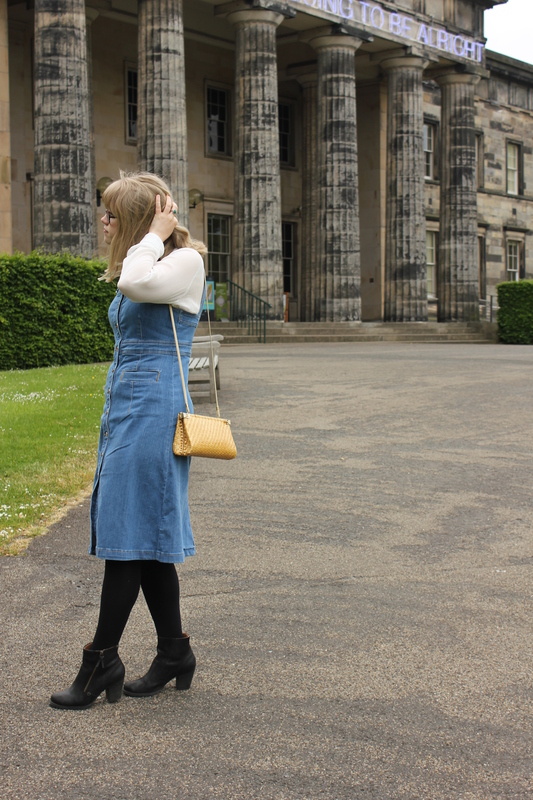 With some clever layering and choice fabric decisions you can be prepared for Scotland’s all-seasons-in-one-day climate and still feel vaguely Summery. 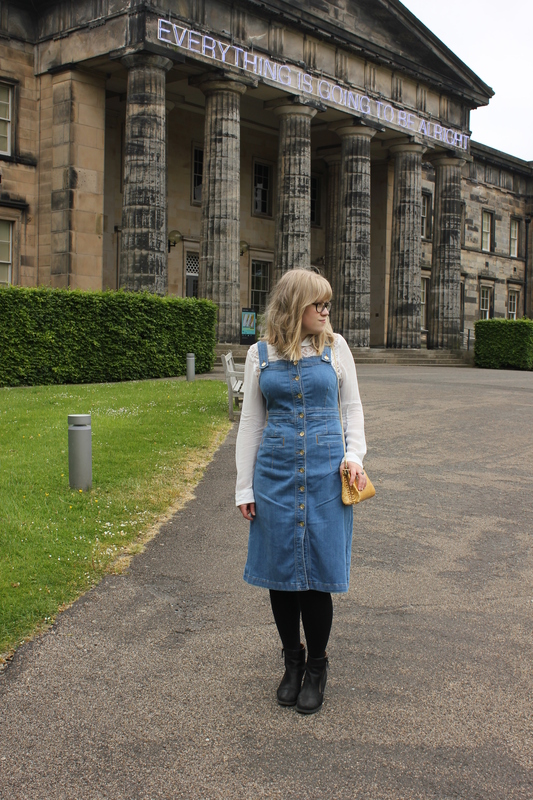 My recent uniform has consisted of this denim pinafore dress paired with a variety of different white or pastel-hued blouses or long-sleeved Breton striped tops layered underneath for style as well as warmth (vest optional). 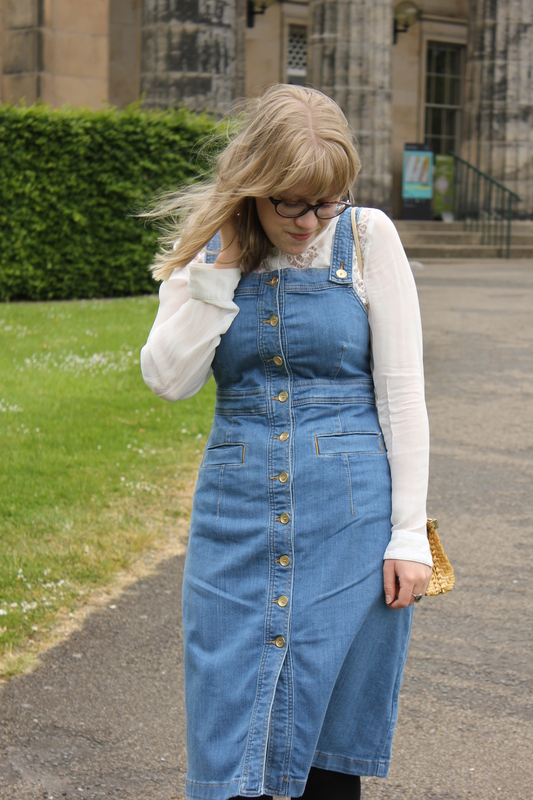 I’ve had my eye out for the perfect vintage pinafore when thrifting for some time – but when you’re actively searching for something specific, chances are you can never find it! 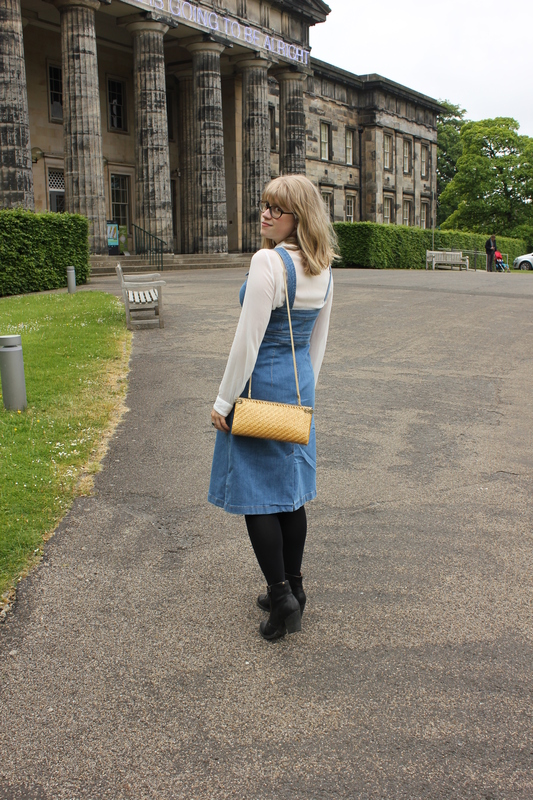 Luckily for me, Marks & Spencer came up trumps with this retro-inspired midi-length design, which I snapped up when there was 20% off their Limited Collection (which I often find has the most ‘me’ pieces in terms of price and aesthetic). 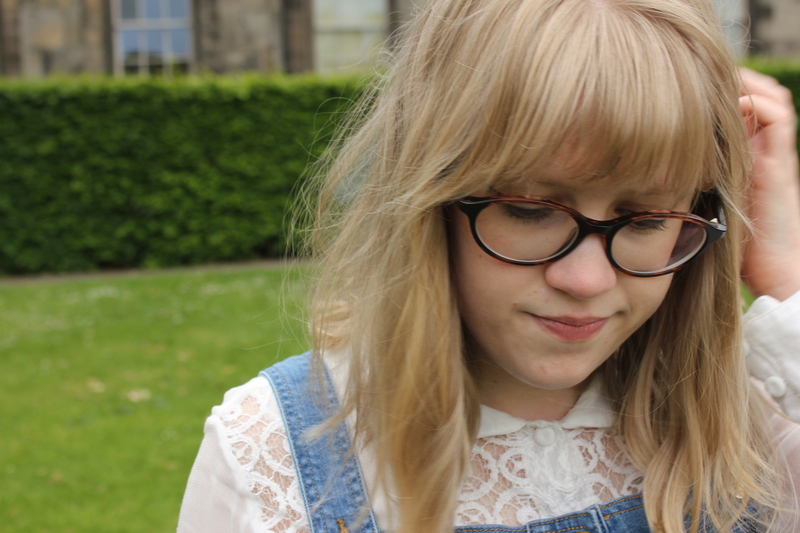 It went out of stock a couple of times and I almost lost heart, but checking hopefully first thing one morning they had had a restock, and I added it to my basket quicker than you can say bargain. I’ve worn it non-stop since. 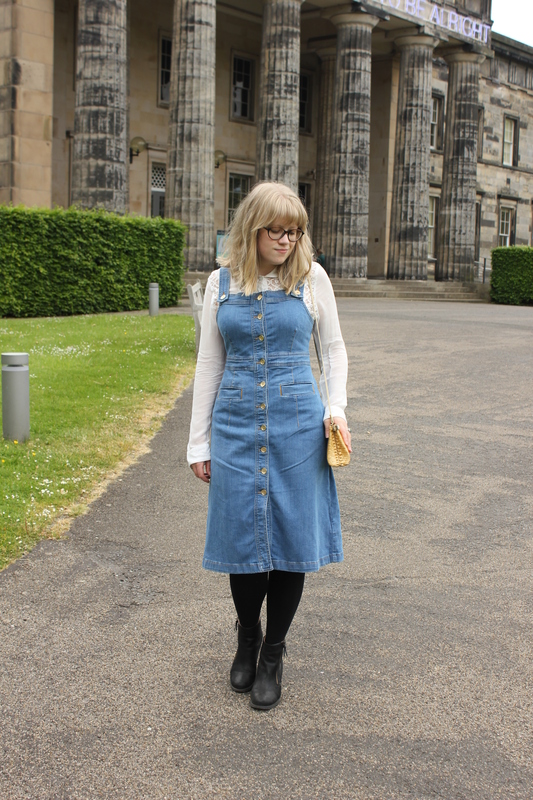 I love the lighter wash, which goes perfectly with Summery colours and layers. 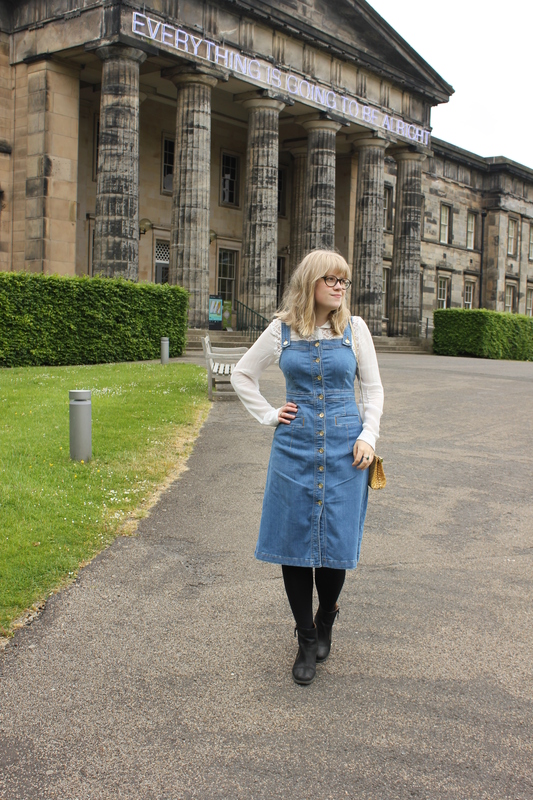 The button-down front and midi length hark back to ‘seventies style but the denim is modern, making my pinny so soft and comfy (if a little creased from our bus journey!) 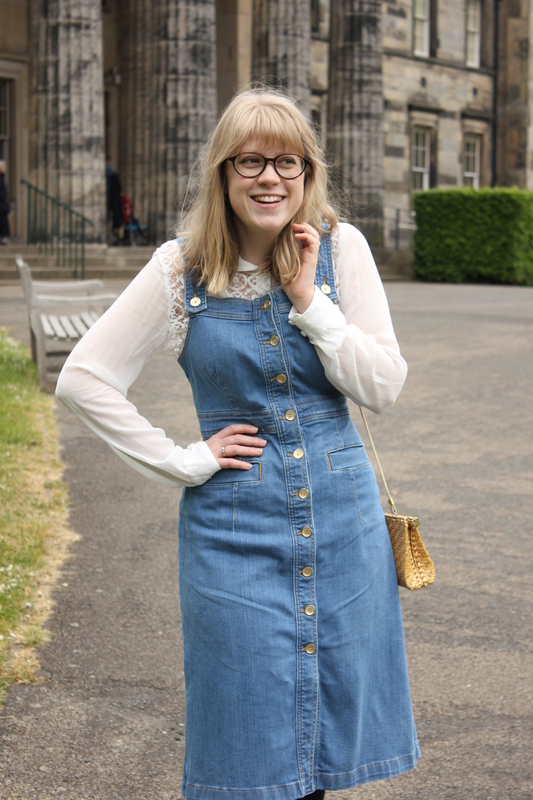 With a thrifted lace peter pan collar blouse, leather jacket, Clarks ankle boots and vintage bag, I can cope with Edinburgh’s unpredictable Summer without feeling like I’ve foregone spring/summer style completely! 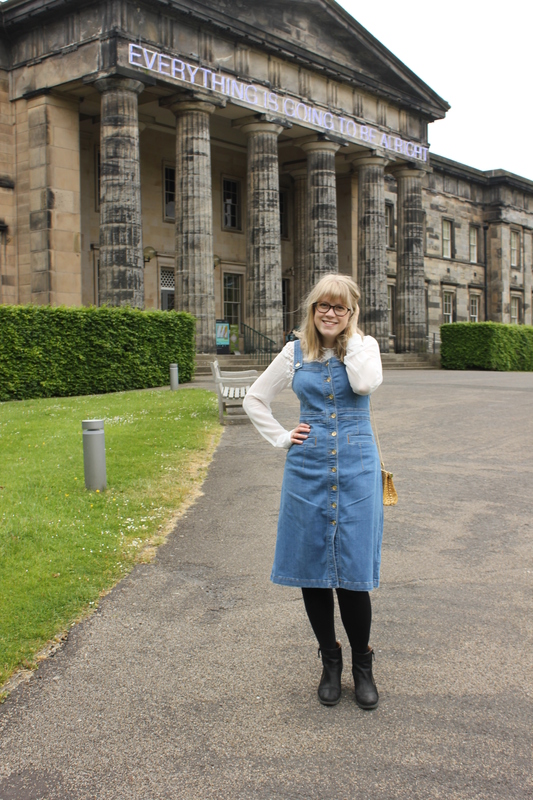 There are so many Summery activities I’m also itching to partake in – like visit the beach and go for a picnic – but when the weather isn’t playing there is still so much to do in Edinburgh. 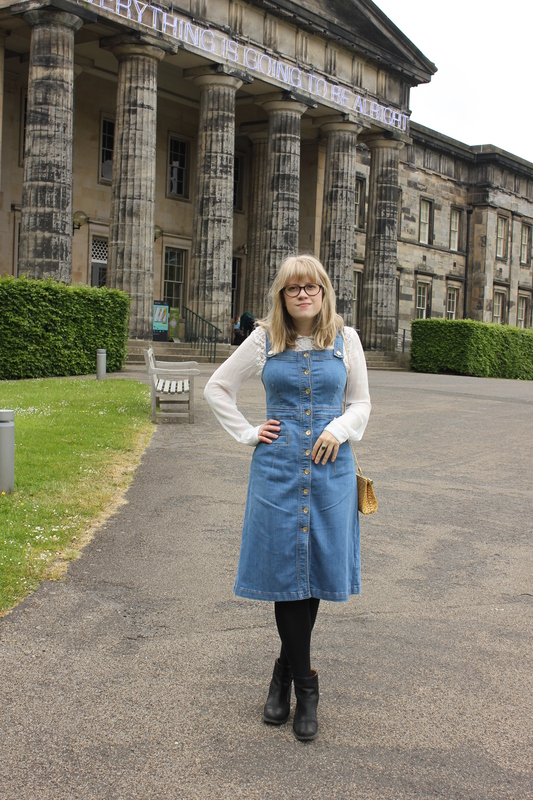 My favourite wet weather activity is visiting one of the city’s many amazing galleries. 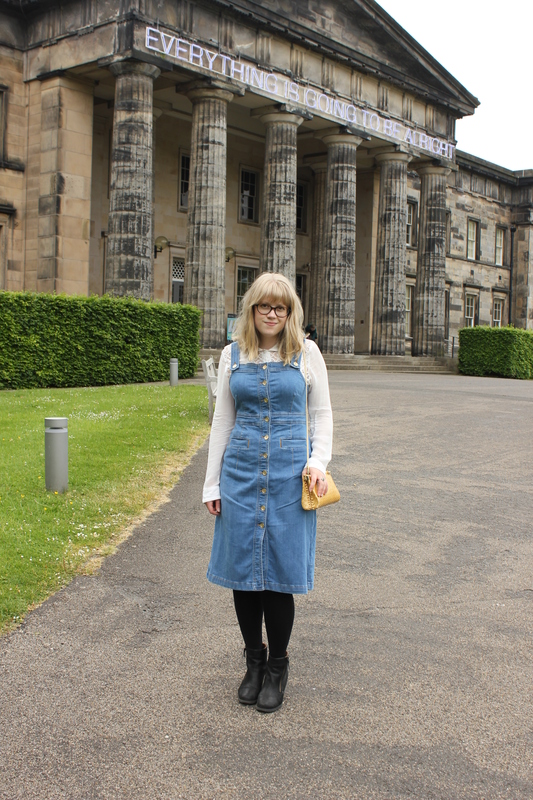 The day we took these pics, the weather was looking unpredictable so we headed to the Scottish National Gallery of Modern Art to the Roy Lichtenstein exhibition, which I’ve been dying to see. 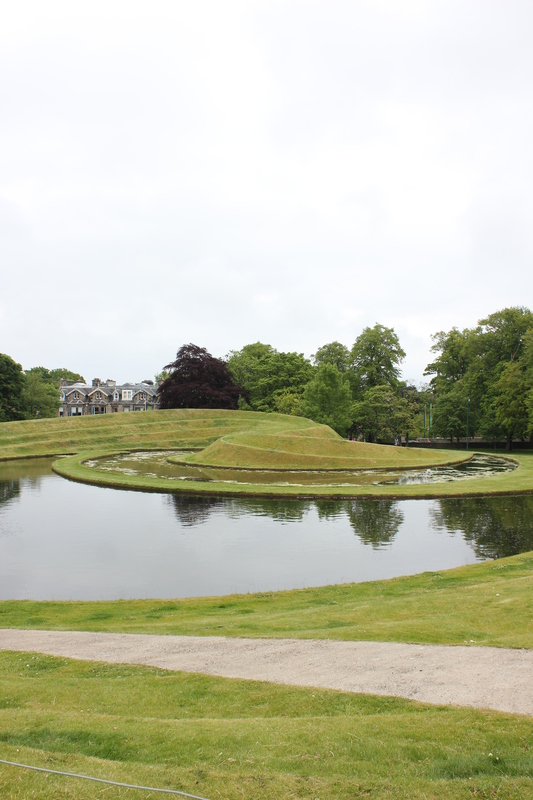 If you haven’t been, I seriously recommend a visit (just don’t wish the good weather away!). 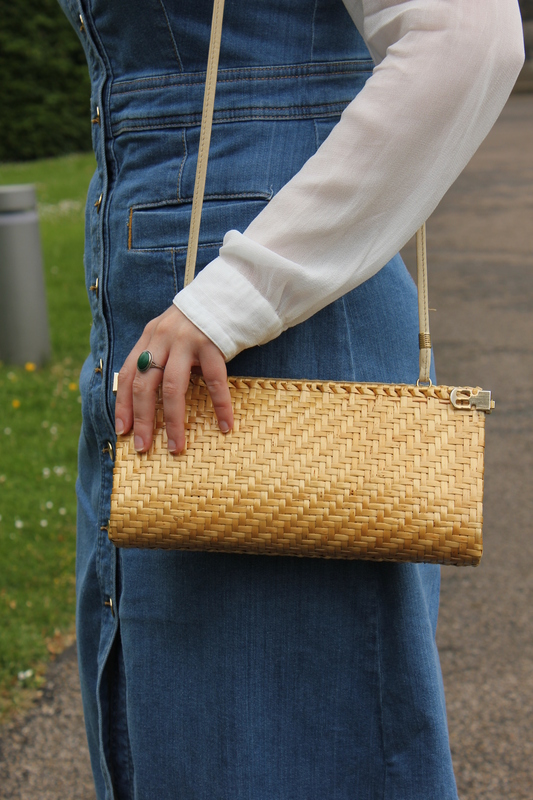 What do you wear when the weather’s miserable in Summer? What’s your favourite wet weather activity where you live? 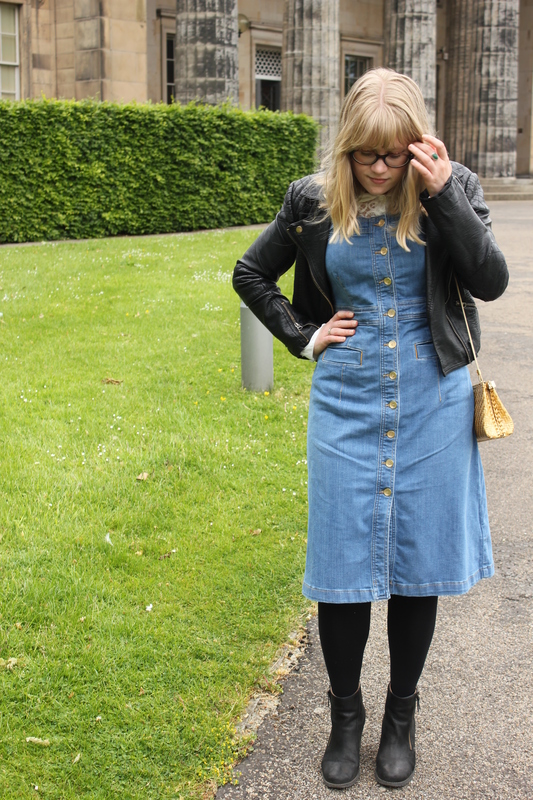 I’m wearing: M&S pinafore dress, thrifted blouse, Topshop leather jacket, Clarks ankle boots, vintage rings and straw bag. LOOKS REAL NICE!—-THE BACKGROUND, TOO! 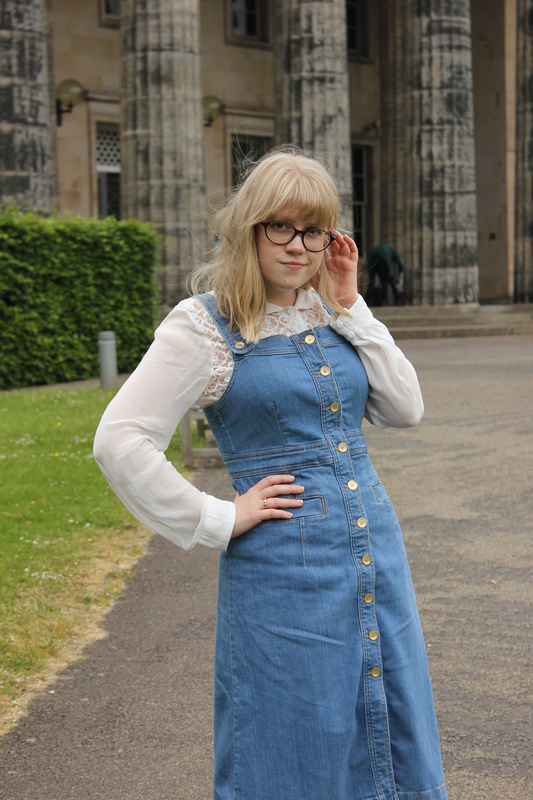 Hello Rosie, Jane Cooper from Firrhill here. I hope you know your school for next year and are happy with the outcome. 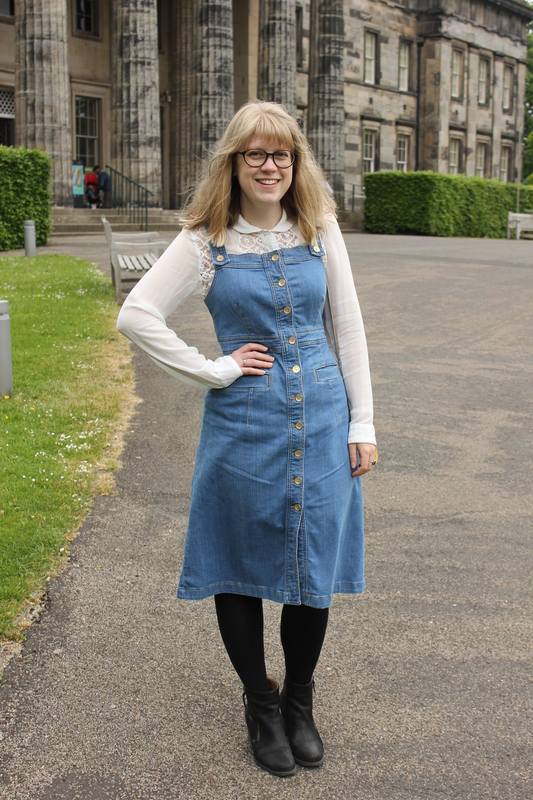 Lovely post – and what a fantastic dress, great find! 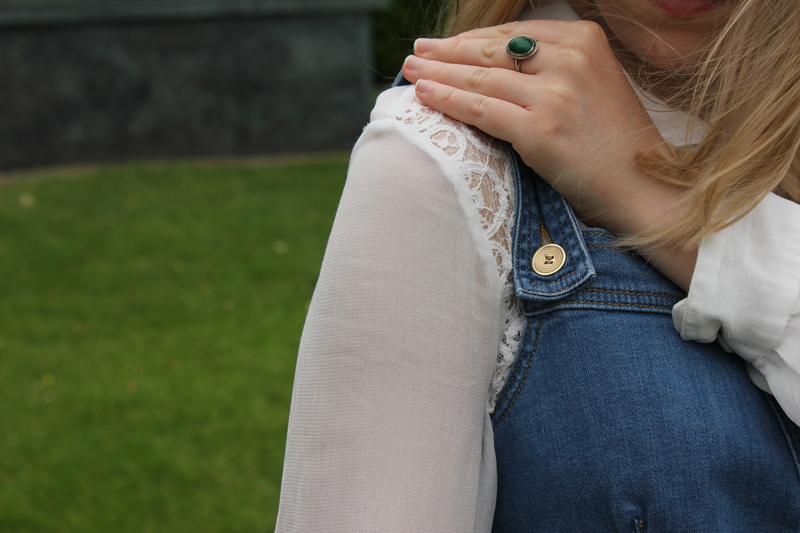 Pretty blouse shame to cover it up !